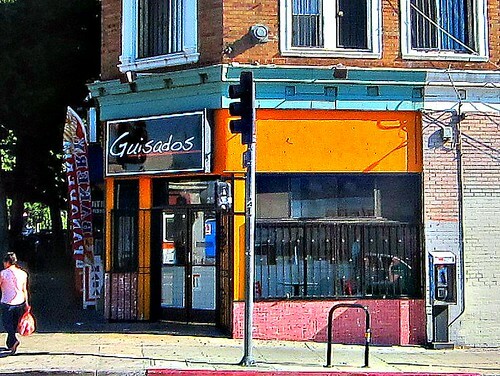 Guisados has been very popular with LA taco aficionados since they opened their doors. It took my awhile to try the tacos. It usually does with the popular places. 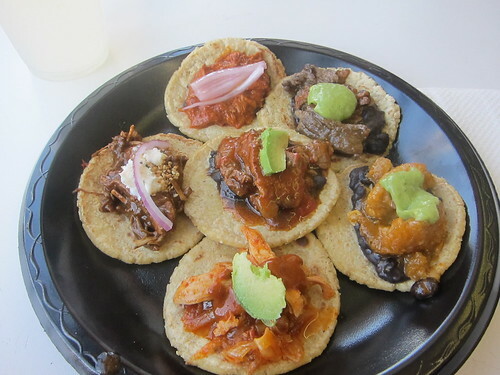 And since the blog has mostly been about taco trucks the last couple of years rather than taquerias I hadn’t written about Guisados until now. Well, what a mistake, guisados may be my favorite place for tacos in all of LA. LA Taco asked me for my top tacos in LA recently for their Taco Madness, I put Guisados cochinita pibil #1.I really love this taco.But all the tacos on the sampler are great. The chicken mole with sesame seeds is delicious; the bistec with chile rojo is a wondrous blend of tender beef, beans, and chile, the tinga de pollo and chicharon are also unforgettable. Some friends from Scotland were visiting LA and wanted go out for tacos. Normally I take out of town people to El Taurino for a pitcher of beer to wash down some carne asada and al pastor with the spicy salsa roja. But this time we went to Guisados. They had never had homemade tortillas before. They wanted to move to LA after eating their tacos. 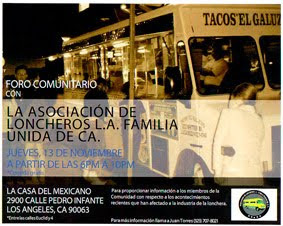 Not just LA but right across the street from Guisados. They talked about the tacos everyday for a week. Scrap the itinerary they said. Forget Disneyland they said. Take us to Guisados. Forget Hollywood they said. Take us to Guisados.Forget Venice Beach they said.Forget Malibu too. Forget everything you know about tacos. Forget the lonely days of winter. Just sing us the songs of spring. I can hook them up with a nice apartment just a few doors down from Guisados. Guisados in Scotland. I smell a new empire. w/b EB. If Guisados loses Taco Madness, I'm never reading LATACO again. Round up the troops and vote vote vote!!!!! The quality and variety there is really astounding. Not to mention the lovely service and owners. YAY! Get out there and vote vote vote! The quality and variety really is astounding. The owners are so so so nice. New tacos weekly! True taco luff. Really looking forward to trying Guisados. I have a feeling it will be more my speed than Mexicali.